June 1, 2015 - Bug guts create drag, and drag increases fuel consumption. But aircraft of the future could be made more fuel-efficient with non-stick coatings NASA recently tested on Boeing’s ecoDemonstrator 757. 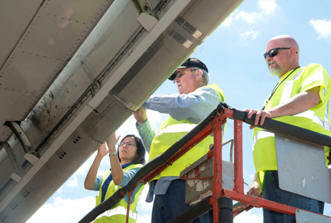 NASA and Boeing engineers spent about two weeks in Shreveport, Louisiana, testing non-stick wing coatings designed to shed insect residue and help reduce aircraft fuel consumption. Researchers with the Environmentally Responsible Aviation (ERA) Project assessed how well five different coatings worked to prevent insect remains from sticking to the leading edge of the airplane's right wing. Most insects fly relatively close to the ground. So, to test the coatings, the 757 made 15 flights from the Shreveport Regional Airport that each included several takeoffs and landings. Shreveport was chosen in part because of its significant bug population. Still, crews had to work around storms and winds to ensure the bugs would be present en masse. Bug residue causing drag has been a long-standing challenge for the aviation community. "One of the five coating/surface combinations showed especially promising results," said Fay Collier, ERA project manager. "There still is a lot of research to be done, but early data indicated one coating had about a 40 percent reduction in bug counts and residue compared to a control surface mounted next to it." "Laminar aircraft wings are designed to be aerodynamically efficient," said Mia Siochi, senior materials scientist at NASA's Langley Research Center in Hampton, Virginia. "If you have bugs accumulating, it causes the airflow to trip from smooth or laminar to turbulent, causing additional drag. An aircraft that's designed to have laminar wings flying long distance can save five to six percent in fuel usage. Surprisingly, all you need are little bugs that trip the flow and you lose part of this benefit." Before they could develop and test non-stick coatings, the researchers had to study bug chemistry and what happens when an insect hits a surface at a high velocity. "We learned when a bug hits and its body ruptures the blood starts undergoing some chemical changes to make it stickier," said Siochi. "That's basically the survival mechanism for the bug." Then the materials scientists turned to nature for inspiration -- lotus leaves, to be precise -- to create the right combination of chemicals and surface roughness in the test coatings. "When you look at a lotus leaf under the microscope the reason water doesn't stick to it is because it has these rough features that are pointy," added Siochi. "When liquid sits on the microscopically-rough leaf surface, the surface tension keeps it from spreading out, so it rolls off. We're trying to use that principle in combination with chemistry to prevent bugs from sticking." Engineers at Langley developed and tested more than 200 coating formulations in a small wind tunnel, then took a number of those to flight on the wing of a NASA jet. They selected the best candidate non-stick coatings to fly on the ecoDemonstrator, while a team comprised of experts from NASA, Boeing, the U.S. Department of Transportation, and University of California-Davis identified the best location for testing. The Shreveport flights followed another set of NASA tests conducted with Boeing in Seattle in April using the ecoDemonstrator 757. The Active Flow Control Enhanced Vertical Tail Flight Experiment evaluated the effect that 31 devices, called sweeping jet actuators, have on the aerodynamics of an aircraft’s tail and rudder surfaces. An aircraft’s vertical tail is sized large in order to add stability and directional control during takeoff and landing, especially in the event of an engine failure. But when the aircraft is cruising at altitude a huge, heavy tail is not as necessary. Initial results confirmed earlier wind tunnel tests that suggested designers could reduce the size of the vertical tail by about 17 percent, decreasing airplane fuel consumption by as much as one-half percent. The active flow control and wing coating experiments on board the ecoDemonstrator 757 are part of several ERA technology demonstrations designed to help reduce aircraft fuel consumption, noise and emissions. With the exception of Boeing proprietary technology, NASA knowledge gained through the ecoDemonstrator research will be made available to the public to benefit industry.